It was a sunny but windy Friday evening at downtown Los Angeles, which played host to this Top Rank/ESPN card. Outside of the Staples Center, young NCAA players were participating in the fan awards jam where players were in attendance with an eager look to reach super stardom one day. Inside the Staples Center, there was a fight card which was headlined by one of the top pound for pound fighters in the game. 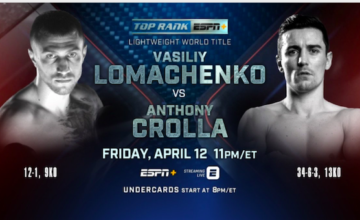 The main event featured Vasiliy “Hi-Tech” Lomachencko (12-1) going up against Anthony Crolla (34-6-3). This fight card was originally scheduled to be a unification bout between Lomachencko and IBF champion Richard Commey but an unfortunate hand injury in Commey’s last fight derailed those plans so the mandatory challenger stepped in, which was Anthony Crolla. With Loma looking to secure a victory in order to pursue a unification and Crolla looking to pull a big upset, this had the recipe for a very intriguing evening in Los Angeles. Let’s see how the fights played out. Lomachencko came into this one with questions looming from his last fight. Those questions were answered as “The Matrix” proved to many that he is still fighting at the elite level. In the first round, there was plenty of chess playing as both men feinted and used angles to try to gain position. In the second round, Loma had enough and started to really pour it on as combination punching was coming from a variety of angles. Crolla just didn’t have an answer for Loma’s offense and in the third round, Loma scored a knockdown. Loma looked to finish it in the fourth as he came out of the corner with the determination in ending Crolla. Loma landed a huge right hook that knocked out Crolla. 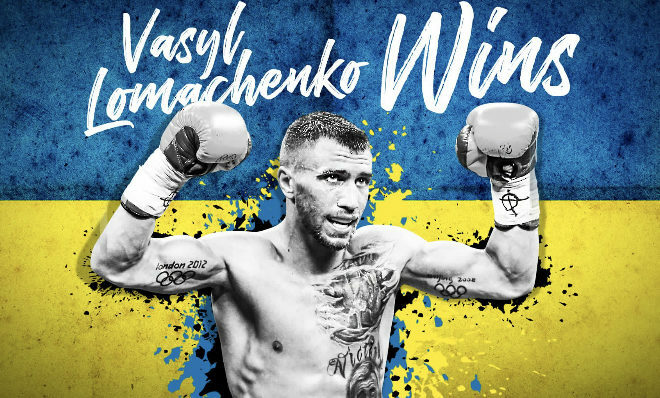 Vasiliy Lomachecnko wins by fourth round knockout. In his first fight at light heavyweight, “Zurdo” Ramirez started it off patiently and established a good left hook to the body during the first round. In the second, it was more of the left hook to the body but Ramirez followed it with a right hook to the head which lead to a greyish mouse underneath the left eye of Karpency’s eye. In the third and fourth round, Ramirez was busting up Karpency and the corner knew that the end was near. Karpency did not come out of the corner after the fourth round so Gilberto “Zurdo” Ramirez wins by fourth round knockout in his debut at light heavyweight. In front of a hometown crown, Arnold Barboza Jr. seemed extremely motivated coming into the ring. In the first round, there wasn’t too much going on as both fighters were trying to figure out distance. In the second round, Barboza Jr. started to get going setting up his shots with that lead left jab. In the third round, Barboza Jr. started an onslaught with a left uppercut and finished it with a straight right hand that knocked down Mike Alvarado, who could not get up to continue. The winner is Arnold Barboza Jr. by third round knockout. This was the opening bout which was for the USBA Welterweight title. The southpaw Besputin came into the first round pumping that right jab and staying composed while Blanco was trying to throw him off with his herkie jerky style. In the middle rounds, Besputin was landing some hard left hooks to the body then coming right back upstairs with a left hook to the head. This combination stunned Blanco a few times but not enough to get him down. In the end, Besputin cruised to a unanimous decision victory with the judges seeing this one 100-90,100-90 & 99-91. Janibek Alimkhanuly gave Cristian Olivas a boxing clinic. In the first round, both men were just feeling each other out although Alimkhanuly was landing a good lead jab. In the fourth round, it was a straight left and a right hook that stunned Olivas but he was able to make it through the round. From the fifth to the tenth round, it was Alimkhanuly offense composed of using good boxing skills, setting up combinations and landing a uppercut that was finding a home each and every time. In the end, the judges saw this one 100-90,100-90 and 99-91 for the winner Janibek Alimkhanuly by unanimous decision. Guido Vianello came in with a gladiator themed outfit and he fought like one right out the gate. In the first, Guido waited and waited and when the time was right, he landed a crushing overhand right that sent Lawrence Gabriel down for the knockdown. Gabriel got up but the referee called the fight as he could not continue. Guido Vianello with an impressive first round knockout. Ruben Rodriguez is a bright prospect that hails from Indio, CA and is trained by Robert Garcia. Rodriguez showed good poise as he was leading with the jab and landing some big shots upstairs in the first round. The left hook in the second round nearly decapitated Snegur but he was able to hold on without getting knockdown. Rodriguez applied a ton of pressure in the third and fourth rounds leading him to a majority decision (30-30,39-37,40-36) victory. Tonight, a crowd of ten thousand one hundred were in attendance to see the man called “Hi-Tek”. The crowd was energetic and supportive of not only the main event but also the undercards as well since there were Southern California fighters billed on this event. Whoever is next for Lomachenko, one thing is for sure, there will be a big crowd to support the fight and it will be one hot ticket.